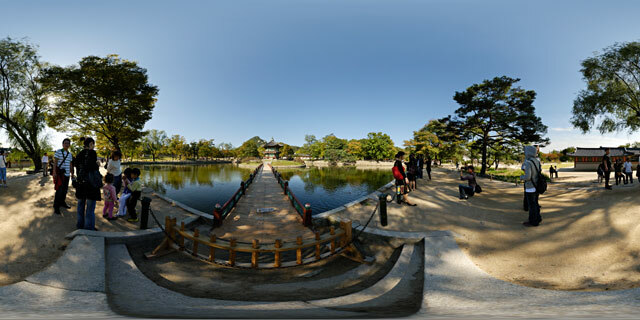 360° VR panorama outside Jibokjae Royal Library in Gyeongbokgung Palace, Seoul, South Korea. 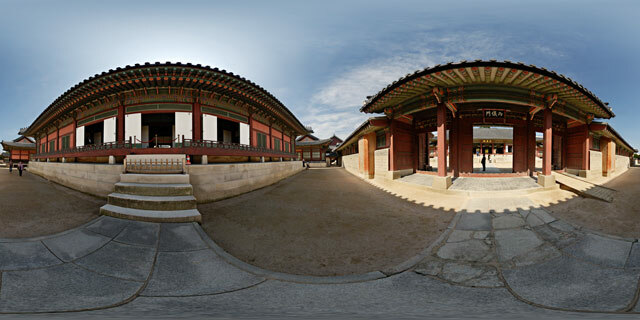 360° VR panorama of Jeongsihap and Nokgeumdang, two buildings forming part of the Geoncheonggung Residential Palace in Gyeongbokgung Palace, Seoul, South Korea. 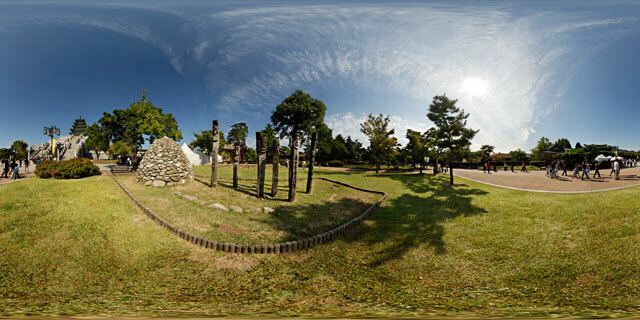 360° VR panorama of the ceremonial stone mound and Jangseung (장승) spirit posts outside the National Folk Museum of Korea (국립민속박물관) in Gyeongbokgung Palace (경복궁), Seoul (서울). 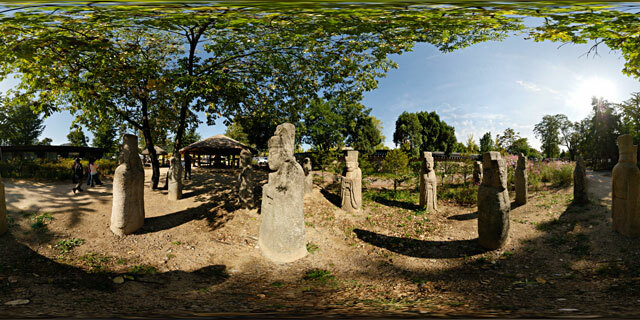 The Jangseung is a wooden pole (though sometimes made of stone) with a face carved near the top. They would normally be placed near the edges of villages to mark the village boundary and frighten evil spirits away from the village. Villagers would also pray to them to prevent calamity and bring a bountiful harvest. 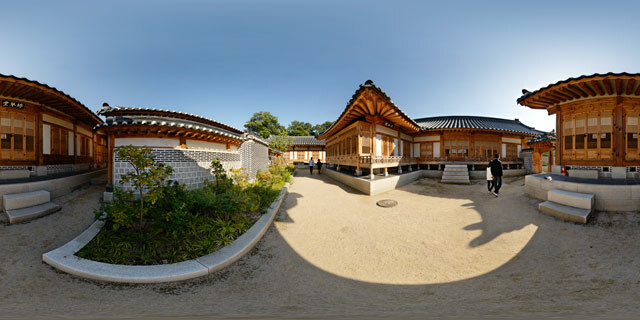 360° VR panorama of the National Folk Museum of Korea (국립민속박물관). It is situated on the grounds of the Gyeongbokgung (Gyeongbok Palace) in Jongno-gu, Seoul, and uses replicas of historical objects to illustrate the folk history of the Korean people. The museum was established as the Korean Folk Crafts Museum in 1924 by the Japanese philosopher Yanagi Sōetsu. That name was changed afterwards by the U.S. Government. on November 8, 1945. The museum has three exhibition halls which illustrate ‘The History of the Korean People’ from pre-historic times to the end of the Joseon Dynasty in 1910, ‘The Lifestyle of the Korean People’, and ‘The Lifecycle of a Korean from Birth to Death’. It also houses a children’s museum and an outdoor exhibition. The museum was originally sited on Mt Namsan, and moved to Gyeongbokgung in 1975. The current building was built in 1972 and housed the National Museum of Korea until 1986. It was remodelled, and reopened as the National Folk Museum in 1993. The building’s design is based on various historical buildings around South Korea. Above description adapted from National Folk Museum of Korea Wikipedia article. 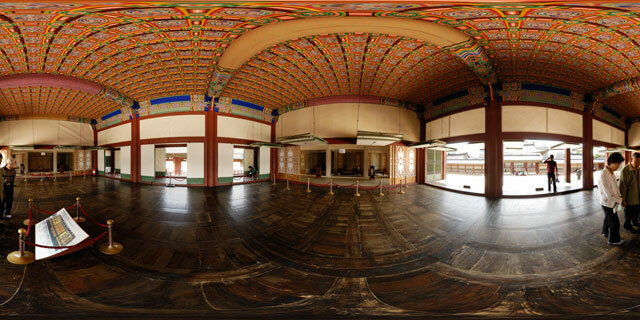 360° VR panorama inside Gyotaejeon Hall in Gyeongbokgung Palace, Seoul, South Korea. Gyotaejeon (Hangul: 교태전; Hanja: 交泰殿), also called Gyotaejeon Hall, is a building used as the main sleeping and living quarters by the queen during the Joseon Dynasty. 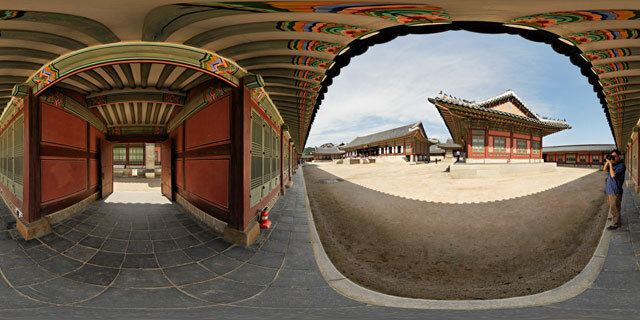 The building is located behind Gangnyeongjeon, the king’s sleeping quarters, and contains the queen’s bed chamber. 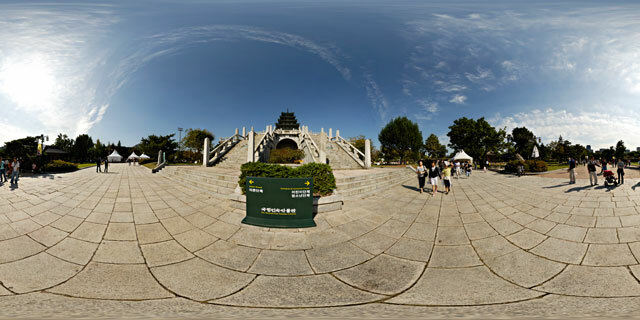 It was first constructed in around 1440, the 22nd year of King Sejong the Great. King Sejong, who was noted to have a frail health later in his reign, decided to carry out his executive duties in Gangnyeongjeon, where his bed chamber is located, instead of Sajeongjeon. Since this decision meant many government officials routinely needed to visit and intrude Gangnyeongjeon, King Sejong had Gyotaejeon built in consideration of his wife the queen’s privacy. The building was burned down in 1592 when the Japanese invaded Korea, but was reconstructed in 1867. Nevertheless, when Daejojeon of Changdeokgung Palace was burned down by a fire in 1917, the Japanese government dissembled the building and recycled its construction materials to restore Daejojeon. The current building was reconstructed in 1994 according to its original design and specifications. The building, like Gangnyeongjeon, does not have a top roof ridge called yongmaru. 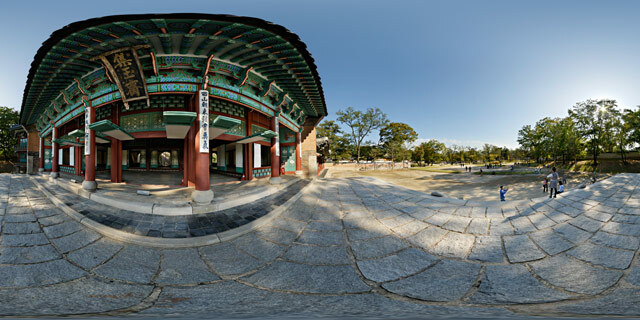 360° VR panorama between the back of Gangnyeongjeon Hall and Yanguimun Gate in Gyeongbokgung Palace, Seoul, South Korea. Yanguimun (양의문) Gate is located behind the king’s living quarters, Gangnyeongjeon Hall (강녕전), and leads to the queen’s living quarters, Gyotaejeon Hall (교태전). The queen’s separate living quarters were built during the reign of King Sejong, who carried out his executive duties in his living quarters, and wanted to allow his wife some privacy from the government officials who would often need to meet with him. On either side of Yanguimun Gate are red brick chimneys, decorated with stylized Chinese characters. The left chimney is decorated with the Chinese characters 萬壽無疆, meaning “long, endless life”, while the right chimney is decorated with the characters 千世萬歲, meaning “thousands of years”. 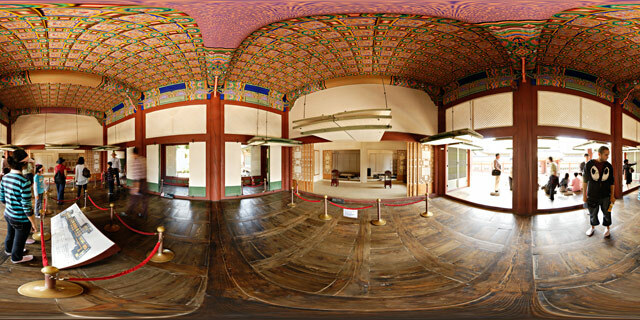 360° VR panorama inside Gangnyeongjeon Hall in Gyeongbokgung Palace, Seoul, South Korea.